20 WHAT'S THE OVER ALL PICTURE? 36 SHOULD MEN RULE OVER WOMEN? God gives blessings for going to church, so by all mean's go to church. A good choice is a church that teaches the reality of God's kingdom, the logic of God's laws and the power of prayer. Follow the directions. 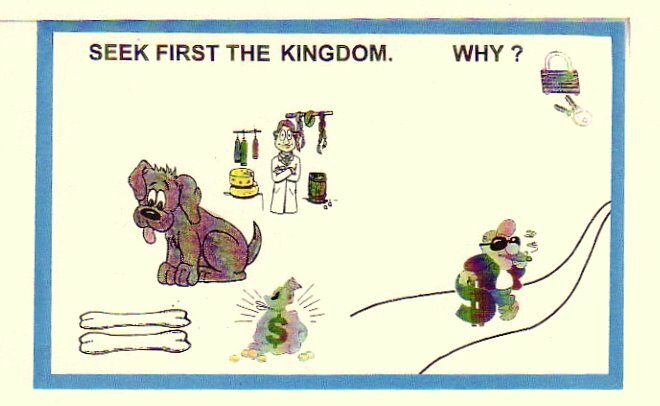 There was a good reason why Christ told us to seek first the kingdom (or coming new world). What you'll discover is that the meek shell inherit the earth which tells us that the kingdom will be set here on earth. Christ also added to this by telling us that the kingdom was at hand, "something you could reach out and touch. This knowledge of the kingdom is very important and exciting, because it explains that today we are standing in the kingdom which is now in the process of being perfected, both the people and some great new technologies. This view point explains what life is all about plus much insight to what the afterlife will be like. Quite simply we can all play a large part in the building of this kingdom with great joy. Yet sadly, most religions or churches offer only a foggy understanding of the kingdom and the afterlife, leaving little insight as to our purpose on earth and noting to get excited about. This is why Christ told us to first of all to seek his kingdom and all of its righteousness. For myself, it was in seeking the righteous things by which I discovered God's kingdom. Matter fact as an ecologist I believe that many in the ecology movement understand more about God's kingdom then many who attend church. This because even those church's who promote the kingdom still push too much of their understanding into the future and end up missing out on many great events taking place today today. The Bible actually gives a lot of detail about the kingdom, now and in the future. For example we are told in Dan 2:44 that in the last day's an everlasting kingdom would be set up and never to be destroyed. Today if someone from only a hundred years ago came back to life, this new world would totally amaze them, so indeed great changes are happening and it is all very exciting. As for God's laws, they are the keys upon which God's kingdom is built and most of these laws we already follow. Therefore my main focus over the years has been the laws of canceling all debts and letting the land rest which you'll find I refer to number of times. Let me explain why. Long term debt is the main cause of divorce, abortions, wars and poverty. To prevent the debt systems from over powering the people and nations, God set a limit of seven years at which time all debts are to be canceled. Now contrary to common church teachings, this law was not done away with. But that does not mean that tomorrow we should cancel all debts, as the system could not handle the shock. On the other hand changes are needed, especially alternative home ideas so that families don't get trapped and loose the vision which too often leads to divorce and abortions. Plus this protects the farmer so that he can produce high quality foods and good health for all. For example, years ago when many started moving from the country to the city. They would buy a lot and the needed materials to build a garage. Then friends would come over and help build the garage which they could live in until they made enough money to buy the material to build a home. Then their friends would get together and help build the home and in helping each other they all had a good time and were able to do most of the work debt free. And this is just one of many alternatives. That's what much of this website is all about, helping folks to help themselves. One of the problems with prayer is that God's communication system is too advanced, we don't see any flashing lights. On the other hand, if we had buttons on our arm like on a cell phone, perhaps more people would believe in prayer. Most folks only use God's communication system in an emergencies, so they don't gain much experience of all the amazing capabilities. Page 3 of this website offers a great deal of insight as to how God's communication system works, plus explaining many other great mysteries of the ages which can build much faith especially in the unbeliever. 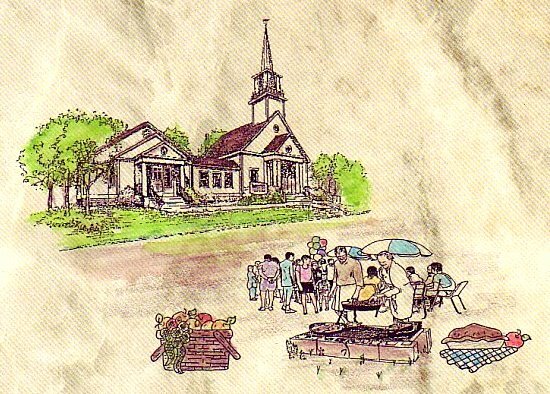 I would also like to see the churches have more prayer groups and hold Sunday lunches or dinners where folks could get to know one another and promote the sort of ideas as laid out on this website, plus many other good ideas. With the power of today's internet and a bit of networking, many great ideas can be brought into really, at next to no cost. This could be a big step toward world peace. If the churches would seek God's kingdom, they would find a lot of unity and real security. Let me explain. Years ago, seeing many great ideas for creating a better world, I was surprised that the churches did not show more interest and it has been the same with many other projects presented to the churches over the years. I thought this was strange, because everyone had heard that the meek would inherit the earth and there were many scriptures supporting this. The problem was that I had taken it for granted that everyone understood this. But as I started asking questions as to what folks believed about the afterlife? I discovered that most had only foggy ideas. Which then raised the question of why? The answer seems to be that people struggle in life to find comfort zones and once there it's hard to budge them from that spot because they fear they may loose something. For this reason many shy away from new ideas. But in doing so they are missing one of the main points of Christ message which was to step out in faith and seek out the righteous things which lead to true security. On the rest of this page you'll find a lot of interesting bits and pieces along with a number of interesting drawings toward the end of this page. Many believe that in the afterlife our bodies will be only spiritual, but is this logical? Consider? Do you want to enjoy sight and sound in the after life? Consider that this requiers eyes and ears and a brain to process all that data, along with a body and the earth to support the brain and all. So form this point of view, it is clear that we need to prepare our self's, developing many needed skills toward building and maintaining this emerging new kingdom age. This is why Christ told us to seek first the kingdom, to gain understanding of what life is all about and what our destiny is, along with learning to walk and talk with our Creator, much like one uses today's cell phones. The Earth is both our training ground and reward now and in the hereafter. Christ's physical resurrection was very real as Christ pointed out to his disciples telling them to touch him and give him something to eat, saying, see, I am not a ghost. Note, many religions teach the idea of only a spiritual afterlife which is so foggy that it is hard to ask questions of. And the less one understands, then this gives the church more power and control over the people. Christ told the religious leaders, 2000 years ago, that they had locked up the keys to the kingdom which is still true today. When you start looking for the good things of the kingdom, you'll discover the beautiful wisdom found in God's laws. It is interesting to note Jeremiah 8:8 where Jeremiah warns us to be careful of the lying pens of the scribes, that have changed Gods laws. This passage makes no since in you King James Bible where Jeremiah's words were changed, but his words are very clear in many newer Bibles, created from older writings. A pastor had passed away and upon reaching the Golden Gates he ask where he could find Paul? And Peter said he's right over there. Meeting Paul the excited pastor explained the many times he had taught from Paul's writings. Then Paul stopped the pastor and asked him what he thought about Matthew 5:17-19 and Luke 24:44? The pastor replied, you know, I am not real familiar with those scriptures. At that Paul grabbed the pastor and beat the stuffing out of him. Perplexed the pastor asked Peter where he could find Christ and Peter pointed over to a throne. As the pastor approached, Christ looked down and said, I see you met Paul. Then the pastor replied, I don't understand? We taught many things in your name and even cast out demons. Then Christ interrupted him, but you did not teach my everlasting laws. As a result there are many broken families, sickness and wars. Depart form me you teacher of lawlessness, I never knew you. Matthew 7:21-23 Pastors need to consider this, because if I am right, then their wrong. The problem is, unless one understands Christ's words on the law, then it is easy to misunderstand Paul's writings and end up teaching a popular doctrine that all of God's laws are done away with. So beware. The Bible tells us. "The truth will set us free". As a note of interest. Christ told the church leaders, "if you will not speak up, then the rocks will cry out". Today's communication systems are built upon rocks or silicon which has become the foundation for today's communication systems. 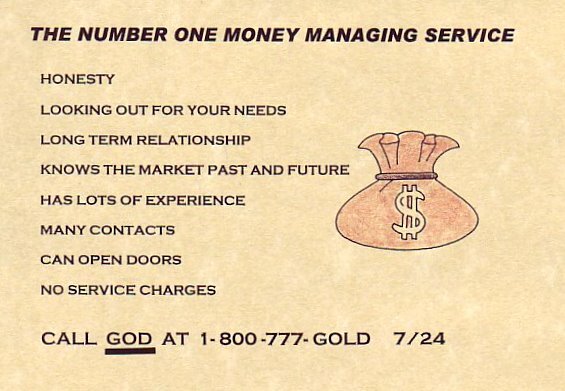 To gain some insight into why God tills us to cancel all debts every seventh year, I highly recommend a video called "Money as Debt" which can be found listed under Google videos. The Bible tells us that "where there's no vision, the people parish". Or we can turn that around to say, where there's vision, there's great prosperity. 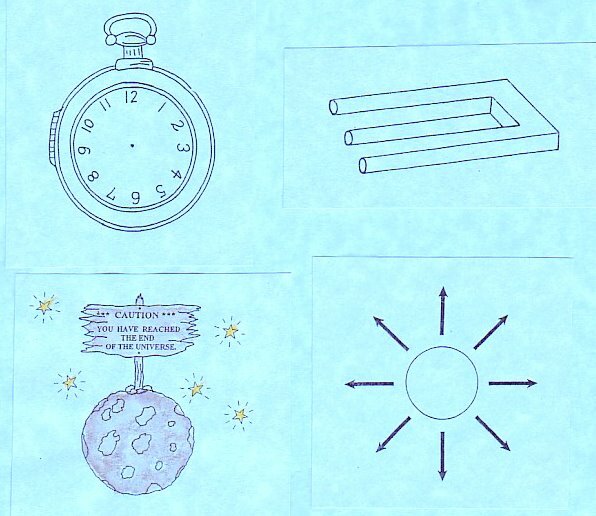 As for as signs and times? We are told that in the last days an everlasting Kingdom would be set up and this Kingdom would never be destroyed. This would be a time when knowledge would greatly increase and many would quickly travel from place to place. Today as we look around at the many new developments and technologies, it is clear that something amazing is happening. For example, consider? What if Moses come back today? All this technology would totally blow his mind. From my technical point of view I see more great developments just around the corner and there's a lot of clean up to do yet. The Bible tells us that no one knows the day or hour of Christ's return and yet the Bible offers a lot of detail as to the season. Now if you're wondering how I came to these conclusions? I simply followed the directions Christ gave, which was to first find the Kingdom and then search out and promote all the good things". Following these directions, then makes it easy for our Creator to provide many opportunities and blessings. For example, after spending some five years in mission type projects, I had a lot of questions and since my background was technical, I started discovering many examples of modern technology in the Bible which convinced me that the Bible was past, present and future. Then sometime later I was pondering what I would like to do in heaven and the idea of building and discovering new things sounded like great fun. Considering this? I thought to myself, that's what I am doing now, so maybe I am standing in heaven and should start thinking and living that way and that's what I have been doing ever since and things get better everyday. But this view did not happen all at once. 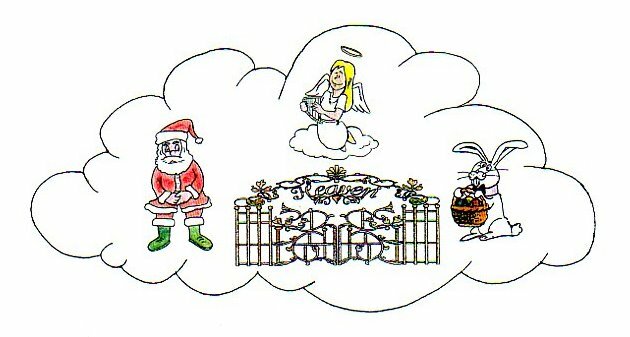 Back in the 60's I had not given much thought to Heaven as being on Earth. But little by little I began to see the vision and started focusing on scriptures that offered more detail. And what I am looking at today is totally amazing and many others are now beginning to see the same vision. Another key toward understanding the Kingdom is the beautiful logic found in Gods Laws. For example, I never liked long term debt because too many people got trapped which lead to millions of broken marriages, abortions and wars. Also I could see that the lack of minerals in the soils of our farmlands was causing a great deal of sickness. The main problem has been that farmers trapped in debt could not afford to build up the fertility of the soil or have time to give the land its rest. The answer is found in Gods Sabbath laws, where all debts are to be canceled and the land given its rest every seventh year. Years ago I started to see the beautiful logic in these laws and that if we would applied them, then we could literally have Heaven on Earth at anytime. Or as we often pray, "Thy Kingdom come, thy will, will be done on Earth as it is in Heaven." I asked some church leaders about supporting this law, but they replied that those laws were done away with. But that did not seem logical to me, so I started digging around and discovered that most of the confusion came from Paul's writings, which also 2nd Peter warns about. 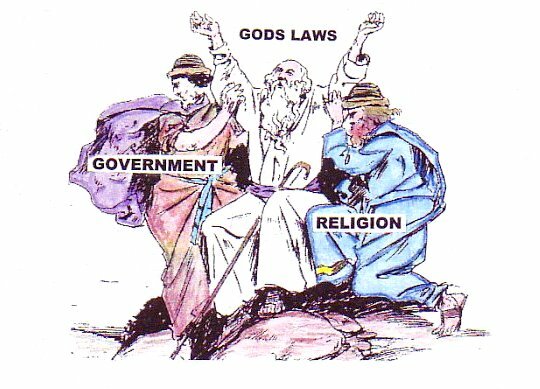 Back then folks understood that when Paul spoke of the laws as done away with, he was speaking of the "ritual laws". Therefore Paul did not need to add the word "ritual laws". Unfortunate in leaving off that defining word "Ritual Laws" this has created many problems. To clear up this confusion simply note that Romans 3:1-2, 4:5-6, 4:27, 6: 13-14, 9:19-32 and 10:17 are speaking of ritual laws. Now lets look at another area of confusion. In Mathew 5:17-19 Christ gives four warnings against doing away with the everlasting laws. For example, we are told that the laws will be in effect as long as the heavens and earth last, which you'll note are still with us today. Then Christ warns that not even the crossing of a "T" or the doting of an "I" would be changed in the everlasting laws. And Christ further warns that anyone teaching that the laws are done away with, will have the lowest position in the Kingdom. How many pastors will fall into that category? There could be many. And what will their jobs be? On the website of a TV program called "The dirtiest jobs" you'll find a listed of the ten dirtiest jobs as an example. Now then, if we move up to the first warning, things get interesting. Because in the Aramaic Christ starts out with the first warning saying, "Do not think that I have come to untie the cords that bind you to the law". (these where the cords used to hold the scrolls of the Bible together). But this is not what we read in today's Bible. Instead we find the words "I did not come to do away with the laws but to fulfill them". However, this should say "to fulfill the ritual laws". This confusion again has lead many to believe that all the laws were done away with. Why was the wording here changed in the first place? The logical answer is that the wording as found in the Aramaic could not be twisted out of context. But even with out the first warning, the 2nd, 3rd and 4th warnings make it clear that God's everlasting laws will always be in effect. Keep in mind, these laws are to protect and give us freedom, not in slave us. In Luke 24:44 Christ reminds his disciples that He only fulfilled those laws which were written about Himself, as found in the Psalms, Proverbs and in the Law. So then, If a law is not written about Christ, then it is an everlasting law. Clearing up some confusion. In the Old Testament we find a lot of history compressed into a few pages, which can lead to the idea that many animals where sacrificed. But if you stop to consider the wisdom here. For one God was teaching us right from wrong and most folks only need to be told once. Plus there was the cost of loosing one of your prize animals which was food for the whole family. So then, your wrong doing's were not only looked down on by the family who could have had a good meal, but also the whole community took notice of how many animals you took to be sacrificed, something most tried to avoid. Another problem in trying to teach the wisdom found in keeping the sabbath laws of canceling all debts is that the "S" is missing in the Fourth Commandment of the Ten Commandments. Here we are told to keep the Sabbath, where as the correct wording should be to keep the Sabbath(s). In the Old Testament it is quite clear that we are to keep the Sabbath laws which also includes going to church. Take your choice of Saturday or Sunday. The laws simply set up a framework to guide us, whereby many blessings can be given. At the same time, there's a lot of flexibility within the law system. 2000 million people, making up the Christian nation's, most have left the Church. This exodus has been painful for many in seeing their children, grandchildren and many friends trapped in a confusing world. What went wrong? One problem is that on the average women out live men by five years. As a result, it's estimated that 80% of the nations wealth, through inheritance ends up in the hands of widows who often see the church as a good place to leave that gift. Understanding this opportunity many pastors are careful not to rock the boat with new ideas but this also limits new vision and church growth. The information as laid out on age 3 of this website was designed to explain many of the mysteries that in the past could only be taken by faith. Therefore these new insights could be a powerful tool to reach many who are outside of the church and looking for logical answers. And the wide verity of subject matter offers many opportunity to share this website with others. The churches also need more faith and examples of faith. For example, over the years I had been so busy pondering the mysteries of the ages that I did not realize the lack of faith in today's churches. So to better understand this, I started thinking back to my youth and noting that even though I had been raised in the church, God was just some force up there in the heavens. Then one day on a retreat, a lady was telling about how she was having car trouble and was led to a Christian mechanic who helped her out. Having worked with cars I found it interesting that God, besides just sitting in the heavens was also into personal networking and very much in tune with every nut and bolt of the technical world. So that's when I started taking notes and today I could write a book about all the Divine networking I've seen. On the bottom of page 12 I have started listing some of these encounters. WHY ARE WE TAUGHT TO LIVE BY FAITH? You could ask the same question about cell phones. Why do we learn to use them? Because we like to be connected. And that's what God is teaching us. That prayer and living by faith is more then just following a set of rituals. Rather Christ is teaching us how to use a system that ties us into a universal network, much like the internet, but fore more advanced. A system that by passes one's ears and mouth connecting directly into our mind. As Christ pointed out, "God knows every thought before we speak". Also this system, just like today's internet is visual. As Christ said "I do what I see my father doing". And more than just visual, it is a means of controlling matter, such as the ability to heal. The movie "What the bleep do we know?" offers some very interesting discoveries into this world. What Christ was explaining is that our minds are like computer terminals tied into the Universal Electric Grid, where by all things are possible. And in the kingdom age, this connection will be very much apart of our existence, just as today's computers have become a real part of our life's. For more insight into the operation of this universal communication system, see page 3. The community Church of a hundred years ago, was more then just an hour on Sunday. Before the telephone and radio, church was also a place to find out what was going on and layout plans of action as need be. With the coming phone and radio, assembling in the Church became less important. At the same time our growing machine age created wealth to pay the Government and others to take care of problems, which left the churches to become little more than social clubs. However at the present time, many new opportunities could open up for the Churches. For one thing, as we loose more jobs to automation and outsourcing, these changes will raise questions as where our next paychecks will come form? Who will pay for our retirement? Who's going to buy the bonds we invested in and other question's? These sort of questions can create real interest in working together and rebuilding communities and this offers real opportunity for the Churches to open their doors and provide many of the new ideas, such as listed in this web site, along with resources and setting up leadership and communications. These efforts could draw in millions of new members of all ages who are also looking for community and the security it offers for start a family or setting up a retirement community and other projects. Also there are blessings for going to Church for God. And despite today's electronic communication system's, we still need human contact. Christ said, it is my fathers joy to give good gifts. What then is our job? Christ said, "if you love me, then keep my commandments." Throughout the Bible our Creator tells that the blessing come though working within the framework of His wisdom found in His laws. We have a destiny, therefore we are being trained to take part in the setting up and operation of an everlasting kingdom hear on Earth in physical bodies. As it is written, "The meek will inherit the Earth". To accomplish this, we are to seek out the good things and work within the framework of our Creators wisdom. In the Old Testament our Creator tells us that if we'll repent, then He well heal our nation. So what should we do? For example God said, if you'll follow My laws, then there will be no sickness among you. Putting minerals back in the soil is a good start. Replanting the deserts is also a good ideas, along with many other ideas found in this website as well as other sources. Note the upper drawing. The dog chose the bone over the money, not realizing that he could have bought the whole meat market. We do the same when we reach for the money, rather than seeking God's kingdom and our destiny. Why the law? Because God's laws are designed to give us freedom, prosperity and good health. The laws are the wisdom of our Creator, given to us. Our Creators laws work best when our government and the church's work together. Our Creator is not a god of confusion, so it's is time to get rid of the old mythical ideas. In today's world of electronics, we can set up real time communication's worldwide and down to the village levels, so that the everyday need can be met. This real time approach will encourage more giving of time, money and talents . Institutions, such as the Churches, know well that children growing up in the church are the easiest converts. But close to 2 billion people, especially in Europe do not attend church and have only a foggy idea of what is going on. On the other hand, whole generations have been exposure to a world of computer's, television and cell phone's and now I-pods, all technologies that can be used to explain the creation process, as laid out on page 3 of "Unlocking the Mysteries of the Ages" and the other pages. The church's in their traditional thinking may not have the technical insight to see the potential here. However, considering the interest of the youth in books and movies, such as Harry Potter! You can start to see the great potential here of reaching millions of people with new insights into the Creation process and the reality of or Creator's words. One way to spread the word. Let's say we go out into the middle of Africa and set up a small Walmart store about the size of an average home. Then let's say we hire some workers and give them pay in three parts, one third money, one third food coupons and one third class room instruction. This would be where they learn how to build the different items needed for self sufficiency. For example the ideas laid out on page 2. Then they can teach others, along with spreading the knowledge of our Creator. And help put in a communication link to the next villages. This offers a base from which to work. At first the store will take a loss, but in time it could turn into a profitable Walmart. I am sure that Walmart could find a few spare dollars to give this a try. Giving should be no problem, when we consider the advantages of letting our Creator take care of things. The Bible, despite it being written by men, their minds and pins were guided by the Creator. The same Creator who has no problem moving micro atoms around the universe. I once asked a friend, who was a lawyer and also a great Bible student and writer? What first turned him on to the Bible? And he replied. As a lawyer he was trained to write clearly, in terms that could not be twisted out of context, even years later. Also he noted, in studying the words of Christ, that Christ choice of words were prefect and even after 2000 years and many translations the meaning is still crystal clear. 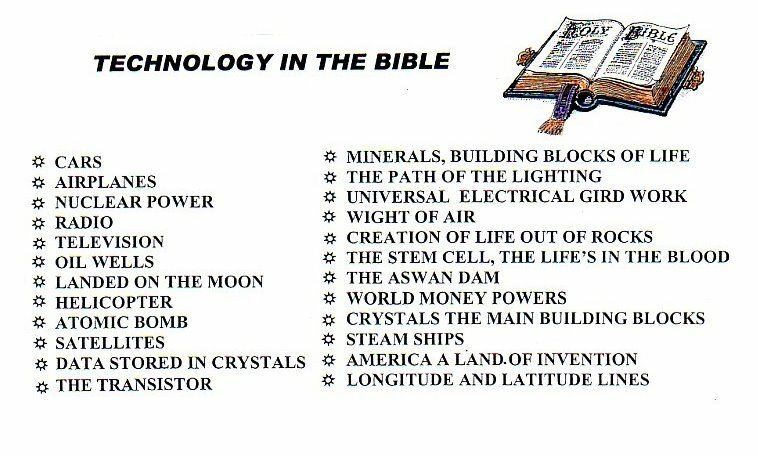 Technology in the bible is another exciting top which I will being explain more about on page 12 of this website. 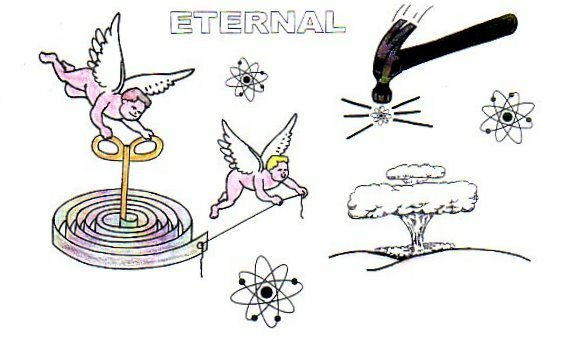 Consider the Atoms, most of them are eternal. How can that be? And how is it that when they come ungluded, we see the result as an atomic explosion or when we try to brake open the inner workings of an Atom, even a $10 billion dollar hammer is not large enough. How were these amazing balls of energy created out of noting? Locked in our world of time, our vision becomes distorted and it is hard to comprehend eternity or eternal knowledge. Yet we do have some examples of eternity. For instance, you can travel in any direction in the Universe and never reach the end, because there can be no end. The Universe can only go on for Eternity in all directions. How can that be? It is just one of those realities, like God. When starting to build a tall building, many times a wooden protective fence is put up to help keep the workers from getting distracted and cut down the nose. This also keeps most pedestrians form seeing what is going on. It may take a year or so just to lay the foundation, just as it has taken thousands of years to lay the foundation upon which many new technologies can be quickly be developed today. With the fence up around the building sight, the average passerby sees very little of the construction and even after completion of the first floors, if one is not interested enough to stand back to see what's happening, they'll miss the whole show and it is the same with the building of God's kingdom. Today God is building an amazing kingdom all around us, yet few take notice of what is going on. But just how much does one need to know? The electrician does not need to know about plumbing and the plumbers don't need to know about the electrical. Each just dose their job to the best of their ability. Only the architect has the real over all vision. This is why Christ told us to seek out the kingdom and also that in the end times an ever lasting kingdom would be set up and never to be destroyed. When working out problems God will interject ideas and I find this a common way that God communicates with me. For others in others, God may use other means of communication. I believe that many have a destiny and over a lifetime we are lead in many different directions to prepare us to reach that destiny. But also along the way we have some freedom to choose a number of paths, and whatever choices we make, God can work with that to give us freedom and to reach our destiny. There is a lot of confusion on this subject as folks often take it personal when much of it has to do with the promises given to Abraham that his decedent's would become a great nation and company of nations. Page 4 of this of this website "America in the Bible" Note the word predesti-nation. The other day talking with a friend, I said, there seems to be a lot of learning, but not much logic. And he replied, they haven't taught logic in school for years, not even much in college. That surprised me a bit, because most of my learning had come from logic. But after thinking about this a bit, I could see where it would be much easier to just have one read the chapter and answer a few question as proof of comprehension. And unless you're a rocket scientist, who needs logic? On the other hand, from a Christian point of view, sound logic, or what the Bible calls discernment is a real gift. Matter fact the Bible is written in such a way as to help develop these abilities. Which could be a real discovery for most churches. The goal here is to build the churches by pointing out problems that need to be corrected. Churches should be able to charge $20.00 per head at the door and have a full house, but to the contrary today's average cost per conversion is around $10,000 dollars. So something is wrong and why have the churches given up on the 2 billion people who make up the Christian nations and why of these nations do only 10% of the people attend church? These are big questions that need answers because Christ said, if you love me, then feed my sheep. So then, if we really love Christ, then we need to make some real changes. Lets consider a number of the problems. One problem is that women out live men. As a result much of the nations wealth pass to the women as inheritance. (At one time estimated at 80%). And many of these women have one foot in the grave. So it's easy to persuade them to pass on their wealth to the church. For this reason many tradishional churches avoid new ideas and avoid rocking the boat. Another problem is that few ministers are technically minded and prefer avoiding such things. As a result many seeking more insight into Gods word for this age, finding little of interest and stop attend church. One reason the churches have written off the Anglo nations and preferring to go to places like Africa, is that in areas of real poverty, they are happy to get anything and willing to be very friendly. Also the churches do not need to changed or think outside of the box. On the other hand the Anglo is hard to deal with, being educated with many liberal ideas and see's all religions as out of date, social clubs with little interest toward creating a better world and again there's much truth. When some in the churches do start asking questions, often they get caught up in doomsday conspiracy ideas, rather then seeing the positive things of God's kingdom that are happening today. Also few understand and believe God's word, that in the last days an everlasting kingdom will be set up and never to be destroyed. Also there's a lack of understanding the law and kingdom, both of which provide the vision and security needed to raise a healthy families. The churches do not teach these things because they do not understand and these are the keys that the churches have kept locked up throughout the ages. This is why millions of people over the last few generations have been drawn to the ecology movement. They are seeking out the righteous things of God's kingdom, even without understanding the message of the kingdom. This is why I keep promoting the kingdom and God's laws, along with new insights to the "Mysteries of the ages". These new insights could bring the churches up speed over night and open the door for millions of new church members. Another problem is that those who do ask questions often get stuck in doomsday thinking and forget that God is building an everlasting kingdom which will never to be destroyed. Over the last 200 years trillion's of dollars under our Creator's control have been spent in many fields to bring forth new things to our Creators glory and our joy and yet the churches have ignored most of this, preferring to keep things in a foggy state of mind. The reason? Too much detail raises questions that threaten the power structure of many religions. So you can see why Christ told us to "seek first the kingdom and all the righteous things of the kingdom". But these many road blocks could have a purpose, because up till just the last few years, we did not understand a number of the keys that now make it possible to unlock many of the great mysteries of the ages. But now we can and it's time to roll out the red carpet. God is building a kingdom here on earth, a project that has been going on from day one. First a process of building the needed qualities within the people, along with building the needed skills to unlock the mineral wealth and wealth of ideas that are today all coming together to bring forth a new age. Its sort of like building a tall building. A lot of time is spent building the foundation and if you don't stop to look through the board fence, you won't see what's happening and when the structure reaches street level, you still can't see what's going on because the fence is in the way. Then as the building begins to rise, if you don't bother to look up, you wont see any progress. And that's the way it is with the building of God's kingdom. This is why Christ told us to, first of all, to find out about the kingdom and a big part of this is in seeking out the righteous things. In doing so you'll discover the wisdom found in God's laws and be able to see what a great world this can be. These insights will start you in the right direction and from there God will lead you. In the process you'll discover many things and learn to see God's guidance, which you'll learn to recognize more and more often over the years. At first many events may go unnoticed. Then looking back, perhaps years later you'll see that these event where part of your needed training. And over the years you'll notice more and more Divine appointments where you show up just in time to meet the right contacts. And then there are a few Divine appointments that are truly burning bush experiences. And the more you learn of God's word and life, it will become clear that God calculates every step we take and through these experiences we gain faith that every step is calculated and that our job is not to worry but rather to just keep moving, learning and giving thanks. And keep in mind, as Christ said, it is my father joy to give good gifts. No two paths are the same, what is your destiny? Many read this into Paul's letters but Christ treated men and women equally and Paul would have done the same, as a follower of Christ. Most problems come from an insecure need to control, perhaps the result of fear which creates problems for everyone down road. We need to keep in mind that it is our Creators desire to give good gifts. Also the believer in knowing that every foot step is calculated can then look at every problem as an opportunity to learn something new, rather then getting up set. These are some of the keys that lead to a peace that passes all understanding and a real luxury in any relationship. One way to build real faith in men is to have them consider page 3 of this website which explains many of the great mysteries of the ages and shows how our Creator knows every step we take. These new insights remove the divisions between the creationist and evolutionist by proving new insights which the Bible supports. For example, the Hebrew word for day is clearly day. But in Geneses 1:5 we are told that the word day means light and light is radiation and can represent the whole spectrum of radiation loaded with the needed data to create the Earth and long before that the whole universe. So then the creation story of the Earth should read. That in the first period of time, came forth the needed data to accomplish certain goals. Then came the second package of data and so forth. Since the concept of radiation carrying data was unknown, then the creation story simply uses the term days. These new insights proved the needed time table for certain events to take place, some events requiring perhaps thousands of years. Yet at the same time it is clear that because of the interdependency of life, that these creations needed to created together, almost instantly. And in a universe built upon layers of digital data this could be done and is the logical answer. With the power of the internet to do research, we can all take turns speaking from the pulpit, which also offers a great roll model for the youth and a means of crossing the generation gap. The churches can help start the ball rolling by opening their doors and providing a place to meet for those wanting work on projects as listed in this website. Or providing a back corner of the lot, for setting up some hands on building experiments. Keep in mind, that in San Diego alone, some 60,000 showed up for Earth Day. These type's of projects can also proved many more tools, support, motivation and satisfaction for those thinking of heading into the mission field. Educational data in the mission fields can be displayed on a flat screen monitors and save 90% of the needed power by using solar back lighting. As a source for free monitors. Many units are discarded because of sight defects. These units could be donated by the manufactures, toward helping the world and also this would creating new markets. Keep in mind, if 3 billion people start earning a extra dollar a day, that creates a new three billion dollar market everyday.